Registration for the 2019 Annual Meeting is now CLOSED. Click the Image to the right to access the registration brochure. Early registration rates available through February 1, 2019. Includes access to educational sessions, exhibit hall, all meal functions, the Banquet, Field Day, Program book and meeting bag. Registration rate applicable to AMCA members with a regular or retired membership. Includes access to educational sessions, exhibit hall, all meal functions, the Banquet, Field Day, Program book and Meeting Bag. Includes access to educational sessions, exhibit hall, all meal functions,specialty tour on February 27th, the Banquet, Field Day, Program book and Meeting Bag. functions, specialty tour on February 27th, the Banquet, Field Day, Program book and meeting bag. Includes access to educational sessions, exhibit hall, all meal functions, Field Day, Program book and meeting bag. Registration does not include access to the Banquet. Includes access to all the social functions, meal functions, Field Day, Banquet and one complimentary drink ticket for the banquet. Rate does not include access to the educational sessions. Includes access to the educational sessions, Field Day, exhibit hall, meal functions and Program book for the specific day(s) chosen. Single day attendees do not receive a meeting bag and does not include the Banquet. sessions, exhibit hall, meal functions, Program book and meeting bag. Acceptable forms of payment include: checks made payable to AMCA (drawn from a US bank in US dollars), VISA, MasterCard or American Express. Full payment must accompany all registrations. AMCA headquarters must be notified of a cancellation in writing. If you cancel your registration on or before February 1, 2019 you will receive a refund of your registration fee less a $50 processing fee. If, for any reason, you cancel your registration after February 1, 2019, you will not receive a refund of any kind. AMCA fully complies with the legal requirements of the Americans With Disabilities Act. 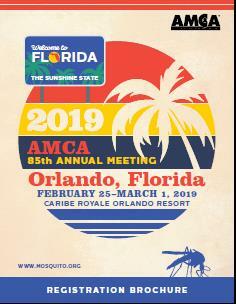 If you need special accommodations or attention to fully participate, please submit a written request of your needs to AMCA at registration@mosquito.org. AMCA cannot ensure the availability of appropriate accommodations without prior notification. Children may accompany a registered attendee or exhibitor during show days and hours, but not during set-up or teardown periods. The accompanying adult is responsible for the child and assumes all responsibility for damage to exhibits and equipment and for the safety of the child.